As far as movie pedigrees go, they don’t come any more impressive than that of The Goonies. Featuring an original story conceived by Steven Spielberg, a screenplay by Chris Columbus, who would later go on to helm Home Alone and Harry Potter and the Philosopher’s Stone, and the directorial talents of Richard Donner (Superman, Lethal Weapon), the film was warmly, if not rapturously, received upon initial release in 1985. It also helped launch the careers of several of its burgeoning stars, amongst them Corey Haim, Sean Astin (Lord of the Rings), Josh Brolin and Martha Plimpton (Parenthood, Raising Hope). The film, as every child of the 80s knows, revolves around a group of kids who, while rummaging around in an attic, stumble upon a wizened newspaper clipping, an ancient doubloon and what appears to be the treasure map of infamous pirate One-Eyed Willy. Intending to solve his parent’s financial woes, Mikey (Astin), after much persuading, leads his friends on a thrilling quest for the forgotten riches. Complicating matters are the attentions of local crime family the Fratellis, who quickly get wind of the plan; the meddling of Mikey’s older brother (Brolin) and a series of terrifying booby traps, dead ends and complications that lay between The Goonies and their treasure. 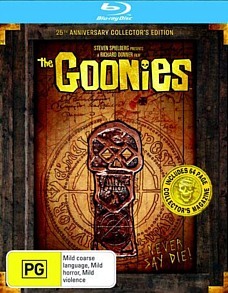 The Goonies is one of the freshest, funniest and most durable of the 1980s adventure films. It still proves a rollicking and gratifying viewing experience after all these years, and its madcap characters offer as much outlandish excitement as ever. For those of us who grew up watching battered VHS copies, this Blu-ray release and the DVD edition which preceded it are most welcome. The Goonies got a decent transfer onto DVD in 2001, and it’s debatable whether the Blu-ray edition offers a massive improvement in picture quality. Though the image features good clarity overall the print still shows its age in places, appearing a little soft at times. Colours are also ever so slightly muted. It looks good, but we’d be hard-pressed to say it looks amazing, especially by the standards of what Disney and other studios are pumping out onto Blu these days. The remastered Dolby TrueHD 5.1 soundtrack is robust, but the DVD also featured 5.1 audio, and once again there really isn’t too much of a difference between the two. All the extras on the present BD edition have been recycled from the decade-old DVD release of the film, and all are standard definition. There’s the audio commentary recorded by Donner and the principal cast mates back in 2001, and the option to view it as a video commentary, with footage of the recording session interwoven with shots from the film. Also rehashed are Cyndi Lauper’s music video for The Goonies R Good Enough and two Deleted Scenes, listed on the box cover as Outtakes. Lastly there’s a 7-minute Making Of. Filmed in 1985, nothing has been done in the way of restoration in the intervening 25 years and the featurette is grainy, extremely soft and riddled with artefacts. It’s a bit of a disappointing haul, considering there’s nothing here that can’t be viewed on the DVD release in the exact same picture quality. The only Blu-ray exclusive is a plump Collector’s Booklet, which contains over 150 photos, artwork, exclusive interviews and various insights into the production. It’s a nice touch, but a couple more BD exclusives wouldn’t have gone astray. The Collector’s edition is also housed in a great looking cardboard case, oversized to allow for the 64-page booklet.